Western Christianity celebrates the Feast of the Annunciation (or contemporary Solemnity of the Annunciation) annually on March 25. This feast commemorates the visit of angel Gabriel to the Virgin Mary. The written record says, that angel Gabriel saluted Mary and announced, that she would be the mother of Jesus Christ. Mary responded to Gabriel with such words “Let it be done to me according to thy word”. Later the salutation of angel became the origin of the Hail Mary prayer. The feast is celebrated since as early as the 4th or the 5th century. The first written mentions of the feast are found in a canon of the Council of Toledo in 656. The solemnity is usually observed on March 25, but sometimes it can be moved, when this date falls within Holy Week. In this case the feast is moved the Monday after the second Sunday of Easter. 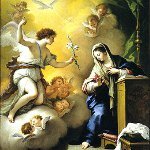 Earlier the Annunciation marked the beginning of a new year in England, Ireland and Wales, since the new calendar system of Anno Domini assigned March 25 as the first day of the year. According to the Catholic doctrine, the age of grace began with the Incarnation of Christ at the Annunciation, that is why this day was believed to be the beginning of a new era.